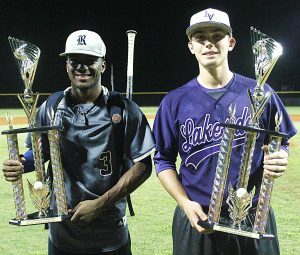 The West Senior All-Stars rallied from an 8-6 deficit in the top of the sixth inning and held off the East in the bottom of the ninth to secure a 10-9 victory to take a 3-2 lead in the DCSD Senior All-Star Classic series on Thursday night at Redan. A six-run outburst in the bottom of the fifth keyed by Redan’s James Parris hitting a grand slam homer had put the East up 8-6 after trailing for the first four innings of the game. The West answered in the top of the sixth with three runs on no hits by taking advantage of three walks and two hit batsmen in the inning. Druid Hills’ Dontravious Huff took one for the team to open the inning and Columbia’s Jamal Huff walked to put two on with one out. Parris would get a strikeout to be one out away from getting out of the inning. But a walk to Chamblee’s Joseph Brown loaded the bases and Decatur’s Keenan Howard drew a bases-loaded walk to score Dontravious Huff. Cedar Grove’s Emmanuel Wilson was hit by a pitch with the bases loaded to push Jamal Huff across to tie the game at 8-8. Brown would score on a wild pitch before a strikeout ended the inning with the West back in the lead at 9-8. Howard would pitch three shutout innings for the West to hold the lead as Wilson would add a RBI single in the top of the eighth as an insurance run at 10-8. Tucker’s Louis Davenport set the West down in order on three consecutive strikeouts to keep the East within two runs heading into the bottom of the ninth. The East would score on an error and had runners at first and second with two out before Chamblee’s Adam Dixon closed out the game with two strikeouts to get the save in relief of Howard who would get the win. Lakeside’s Kiernan Acklin gave the West an early 2-0 lead with his RBI single in the two-run second inning. The East would counter with a run of its own to make it 2-1 on a RBI double by Arabia Mountain’s Aaron Douglass. 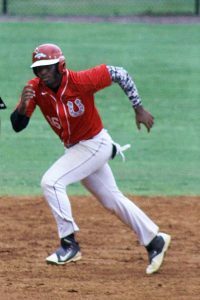 The West extended the lead to 6-1 as Dontravious Huff and Chamblee’s Van Markiton drove in runs ahead of Acklin’s two-run homer off the scoreboard in left field. The East picked up a run in the third on a RBI double by Davenport to cut the lead to 6-2. The big fifth inning keyed by Parris’ grand slam including a RBI single by Stephenson’ Anthony Johnson. Acklin was named the West MVP after going 2-4 with three RBIs and homerun in the game. He became just the second Viking to earn Senior MVP honors joining Nathan Terrell (2010). Parris became the fourth Redan Raider to earn Senior MVP honors with his grand slam and four RBI in the game. He gave the Raiders back-to-back MVPs for the second time following Walker Jordan’s 2016 honor. Shawn Payne (2007) and Travis Bell (2008) were the first pair of Raiders to go back-to-back. Retiring Columbia head baseball coach Steve Dennis went out with a win in his swan song as a DeKalb County baseball coach. Dennis, a GCA Hall of Famer, has won over 400 games in his 29 seasons at Columbia.